In less than a week, a new film critiquing the many mistakes of Al Gore’s global warming alarm movie An Inconvenient Truth, will be released. Not Evil, Just Wrong discusses the impact, not of global warming, but of global warming alarmism, and the shaky facts that this political abuse of science is causing. But what McAleer and McElhinney won’t stand for is watching people suffer while serious, glaring misinformation guides public policy. That happened during the misinformation campaign surrounding the use of DDT years ago to stop the spread of malaria, they say, and it could happen soon if the U.S. adopts cap and trade legislation which will hamper industry and curtail American prosperity. 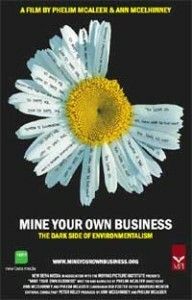 The film sprung in part from their last film, Mine Your Own Business. The documentary slammed environmentalists for holding back progress in impoverished communities. McAleer recalls working as a liberal journalist assigned to cover ?an evil capitalist mining company for the Financial Times. When he arrived on the scene, “I discovered everything the environmentalists were saying was exaggerated or untrue,” he says, adding the locals wanted the new mines to improve their standard of living. I agree, they are being a little disingenuous in that they are using some namecalling and derision. However, the important point is that they are not being anti-liberal. They really are about protecting the people from bad policy. But they are not saying that Gore's film was liberal or socialist, but that they THE FILM MAKERS are. They are labeling themselves as 'for the people' so to speak. "A little disingenuous"? Like a little pregnant. CAn't even admit your mistake? hurry hurry everyone turn off your electric for a week to combat global warming.. I have come to the conclusion people are self centered. Most people will only care about something that effects them personnally. Even if it has been said to effect them 10 years down the road. People wont worry about it or change there habits untill it happens. Why do people still use the rain forest for there wood supply when we could use a more eviroment friendly product called bambo. Why did people vote for obama? People don't care about there actions untill the very second it effects them. "Bambo," son of Rambo and Bambi, environmentally friendly scourge of the forest. Bambo, that's good. Miss America should take some courses in editing. Or spelling. Or engrish. But he's right about bamboo.